I saw this cartoon in a recent Facebook post. The artist actually has a web site here where he posts cartoons that he draws for his home church’s Sunday bulletin and that he also offers to others to use. Kudos to the artist! We all have broken ‘stuff’ in our lives. If not for Jesus buying us back (redeeming us) Satan owns us! Jesus did & does literally ‘purchase’ men for God. (See Rev 5:9). We are all ‘one of a kind classics’, with unique DNA and created in God’s image. 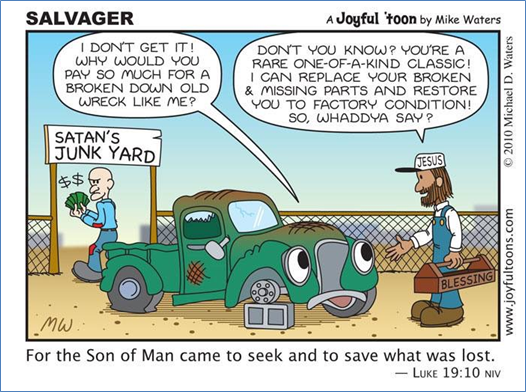 Jesus can and will fix all our broken parts! Jesus DID come to seek and save the lost! At the same time, I would like to offer a few personal comments and a serious suggestion. When we’re asked “What do I gotta do?” we tell them to “Give your heart to Jesus”, “Just invite/accept Jesus into your heart,” or a variation thereof. But here’s the thing. Our main problem, out of which all others erupt, is SIN. We have been broken since the Fall of Adam and thus, slaves of ‘sin’, not just victims with broken bits here and there. Am I saying we shouldn’t talk about what’s ‘broken’ in people’s lives? Of course not! But in our conversation about all the broken stuff we need to take the discussion to the real problem, do a little ‘root cause analysis’, if you will. Then when we get to the ‘main thing’, and not until then, we can offer God’s solution – forgiveness through the shed blood of Jesus Christ, with which he ‘purchased men for God’. Then we can also talk about the need to respond to that offer – the “Whaddya say?” question. And so I ask you (and myself) again. . .
Well, I’m in a conversation with a few professing Christians who don’t think the issue of sin needs to be part of the conversation leading to salvation. Heavy sigh. . . .